Double Major- Studies in the Political Science Department parallel to studies in a different department of choice. Single Major- Extended studies in Political Science combined with complementary courses from outside the department. In the first year of study, all students are required to study in the Double Major track. Students will be allowed to change to a single major track, upon their second year of study if he/she meets the requirements outlined in chapter 4 of the Annual Catalogue of the Faculty of Social Sciences. 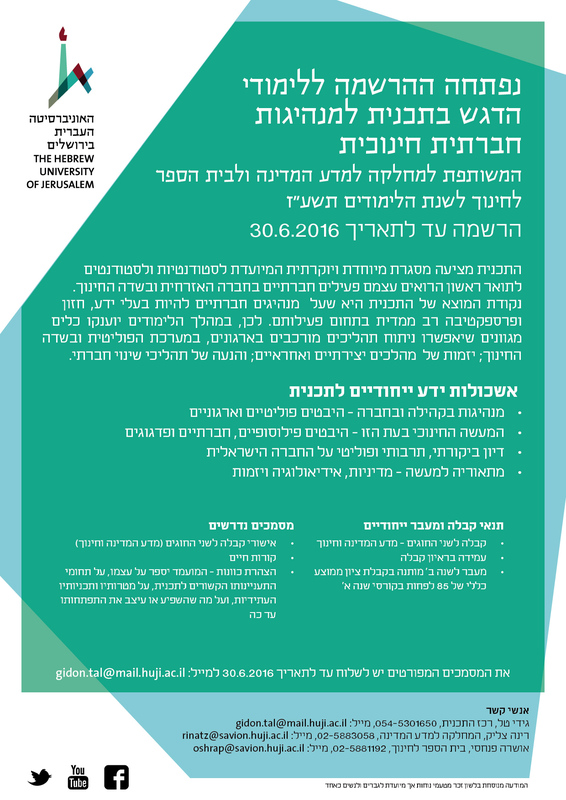 Studies with an emphasis on educational social leadership, a collaboration between the School of Education and Department of Political Science (link to information flier in Hebrew). The program offers a unique and prestigious framework geared for undergraduate students who consider themselves socially active both in the civil and educational fields. The basis for this study program is that social leaders should be knowledgeable, with vision and multidimensional perspective in their field of activity. Therefore, during their studies these students will be endowed with a wide range of tools which will allow them to dissect complicated processes in organizations, political systems and the field of education; initiatives of creative and responsible processes; and driving processes of social change. Studies towards a certificate in education in Citizenship. This track opens each year and students who complete their second year of studies are accepted.